In 2002, Maya Angelou was the speaker at the University of Illinois’ commencement. It was a cloudy day, and all the dusty old Important University Administrators droned on and on with their dusty old words. And then Maya Angelou was introduced. She stepped to the podium, opened her mouth, and her honey-rich voice rolled out singing, “When it looked like the sun wasn’t gonna shine anymore, God put a rainbow in the clouds!” Then she called out into the mass of people, “Good afternoon, rainbows!” It was 8 years ago, but it could have been 5 minutes for how full and powerful her voice still is in my head. When she talks about rainbows, Maya Angelou is talking about kindness and hope (the lyrics she sang are from a 19th-century slave song). She has told students many times: “I call you rainbows in the clouds from a story in Genesis when it rained on the land so long the people thought it would never end, and God placed a rainbow in the sky to make it ease and give the people hope. This is what you are to your society.” She has also said that, “God puts rainbows in the clouds so that each of us—in the dreariest and most dreaded moments—can see a possibility of hope.” I’m sure she said these things in her U of I speech, but all I heard was, “Love, love, love.” That’s what her voice was really saying. One of the things that I’ve always loved about Maya Angelou is that she talks about love as a force of nature: “Love builds up the broken wall and straightens the crooked path. Love keeps the stars in the firmament and imposes rhythm on the ocean tides. 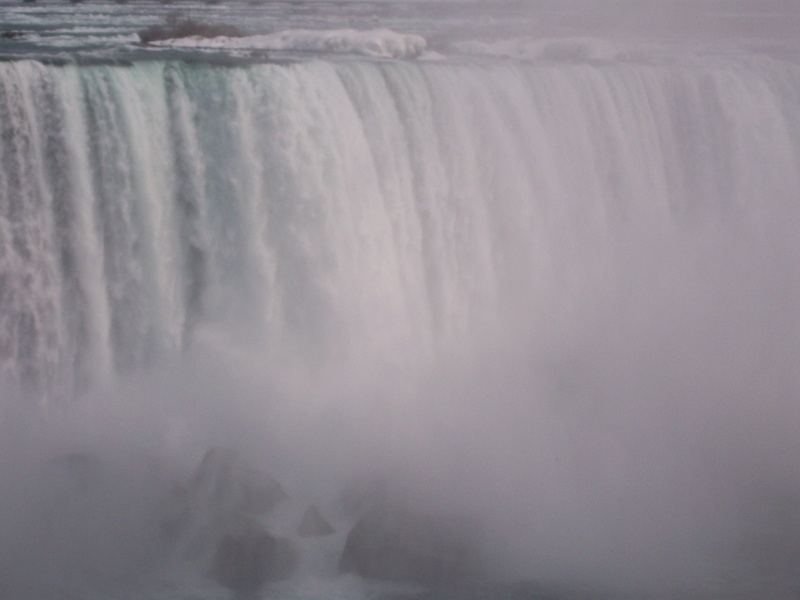 Each of us is created of it and I suspect each of us was created for it.” Being at Niagara Falls has me thinking about forces of nature, and right now, I’m feeling a little disappointed in myself. 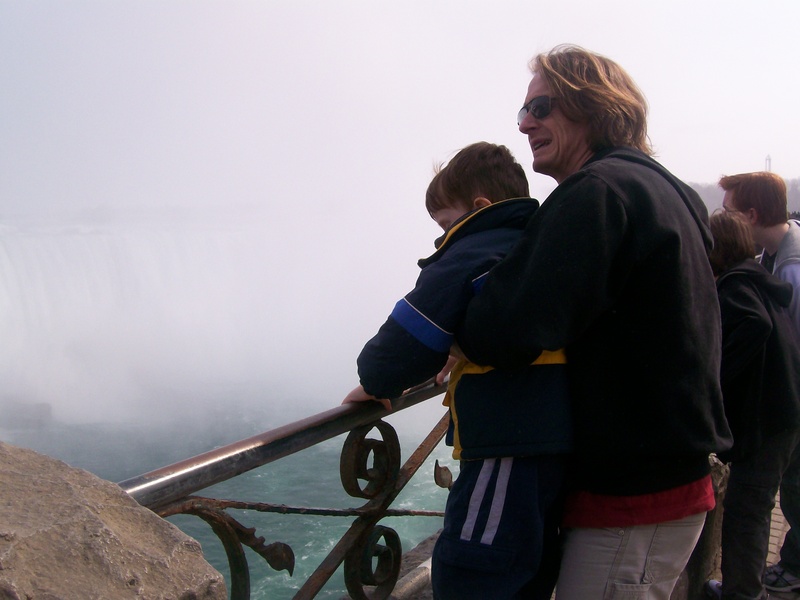 When we first got out of the car to look at the Falls, the boys raced to the metal railing and immediately started looking for rocks to throw into the water. I did notice the Falls, I’m not saying I didn’t, but the main thing in my head was a high-pitched banshee scream–“JESUS MARY AND JOSEPH STAY AWAY FROM THE RAIL!!! !” I have a phobia about heights for myself, but it’s almost unbearable when it involves the boys. Whenever they are on or near anything that they could potentially fall from, even a large rock, I feel like my skin is going to peel off. When Martin lifted Gabe up so he could see over the top of the railing, black spots appeared in front of my eyes and I saw Michael Jackson dangling his baby son out of that hotel window. I was practically hyperventilating by the time we headed to the tour of the tunnels under the Falls. The boys of course hate this paranoia, and do things on purpose to terrify me, like climbing onto our roof, hanging from trees in the yard, etc. Even Gabe was irritated by my death grip on him as he was throwing little pebbles over the rail: “Mama, it’s OKAY!” I take this as a good sign because it means that my fear has not made them fearful. And I wish I didn’t have this fear but I do. It’s this overwhelming visceral terror that I don’t know how to shake. What I would like to know now is has she EVER been to Niagara Falls? Is this poem just a powerful but theoretical metaphor, or is it a real way to look at your life? And would I give my boys this message? 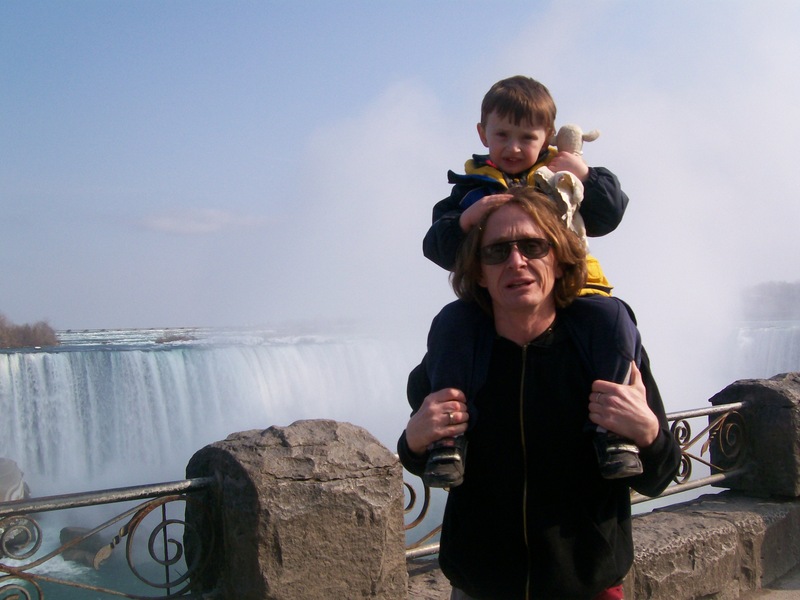 Standing there, faced with the unstoppable, thunderous power of Niagara Falls, would I tell my sons, this is an amazing metaphor for how to live your life? There is life without love, but it’s so not worth it, and no matter what it takes, you need to do whatever it takes to follow what you love, to have a life, not just a living, to BE love, to yourself and to others. Could I tell them that? Could I tell myself that? Could you? 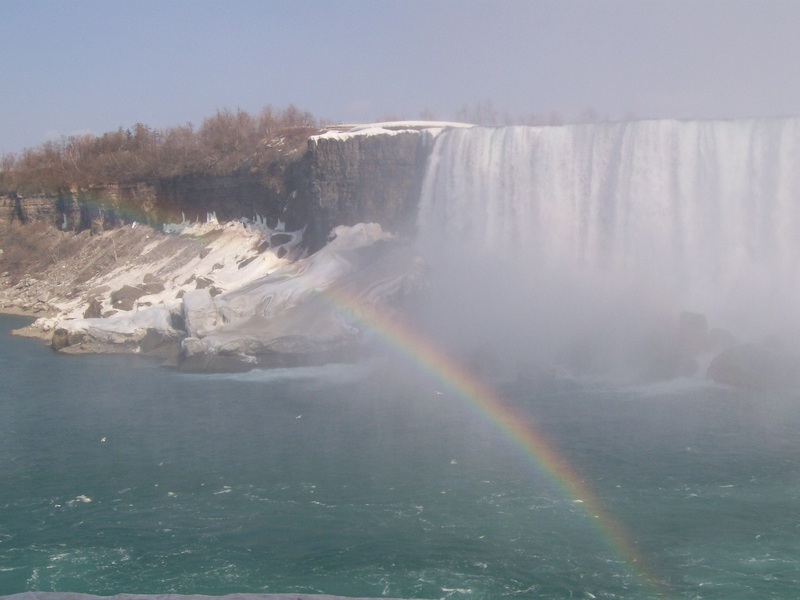 On the tour through the tunnels that leads you behind the Falls, we saw a beautiful rainbow, which I now understand as much, much more than just a prettified tourist attraction sight. When we got married, the story of Noah was the first reading at our wedding ceremony. 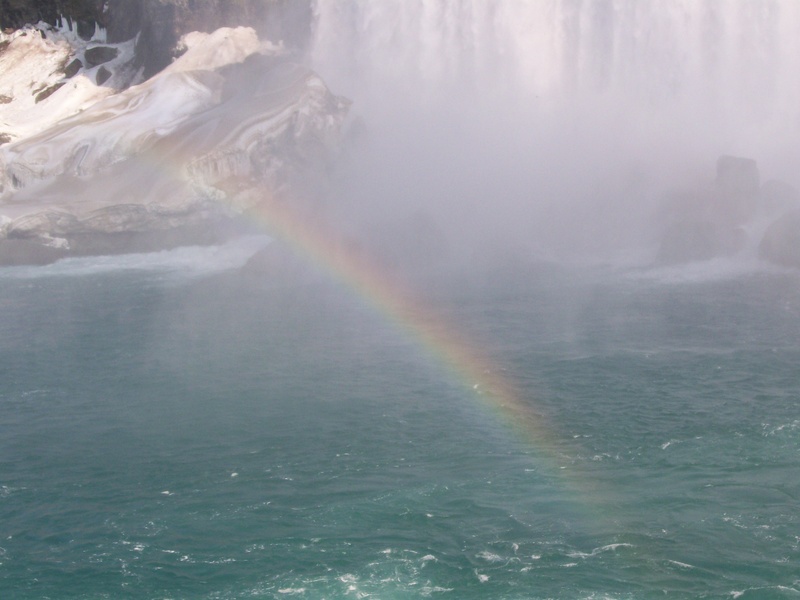 The rainbow is God’s covenant, His promise: “I have set my rainbow in the clouds, and it will be the sign of the covenant between me and the earth.” The promise is that God will not wreak devastation upon all of humanity again as He did in the flood. Maya Angelou wrote that, “Love recognizes no barriers. It jumps hurdles, leaps fences, penetrates walls to arrive at its destination full of hope.” Love is a force of nature. Fear may be a force of nature too, but as poet and artist Michael Leunig reminded us, that’s our only choice: love or fear. I wish I could say that I’ve made my choice, but I can’t. I’m stuck somewhere between my head and my heart. But I do have hope. Here are a few quotes from Maya that I love. I hope you love them too! The pictures are beautiful and so is this post. A good goal for me on this rainy day will be to try to be a rainbow in someone else’s cloud. Tell Gabe to throw a rock in there for me. Don’t worry Laur. You are my rainbow regularly. And Leslie, your daily posts are like some sort of emotional nutrition at this point. Thank you, both of you. There are tears in my eyes and a lump in my throat. I understand the terror and the yearning. I look at Zoey – so beautiful, so in the moment, so full of life and living. I celebrate her (even when she’s pulling her foot away from me for the umpteenth time when I’m trying to tie her damn shoe! ), and want to protect all of the passion and awe and zest that she has. How do we preserve these beautiful beings in ways that enable them to function in a world that so often falls short? How do we find and preserve our own passion in that same world? Today is the three year anniversary of my son, Theo’s death. He was taken from us when he was 32 weeks in utero. This is why we chose the name Zoey – it means LIFE. Theo reminds me that life is not fair. That people suffer and feel pain even when they don’t deserve to. That life is robbed of of those who don’t deserve it. Zoey reminds me that even though life doesn’t make sense – it is worth living. And when she comes to me – at 3 and 5 and 50 – with the wetness of tears on her face, wondering why people are sometimes cruel and life is unfair, this is what I’m going to tell her: it is worth it. No matter what happens, being able to breathe, to watch Zoey grow up, to love my husband and be loved by him (in all our imperfections), to have friends who bring food when I can’t walk on my own – all of this is worth whatever price we pay. I’m so glad that I wrote this and you read on the anniversary of Theo’s death. Thank you so much for reading and sharing and for being who you are. Why would the falls only be a metaphor for us? Why shouldn’t we be one for the falls also? Beautifully written! I hope you don’t mind that I shared your blog post because I was graduating at U of I when she gave the speech.